Or as the game would be known in English (if it were real): Downtown Girls’ Hot-Blooded Story. Actually, I shouldn't say the game isn't real; it is real, in that it exists, but it certainly isn't an official release. 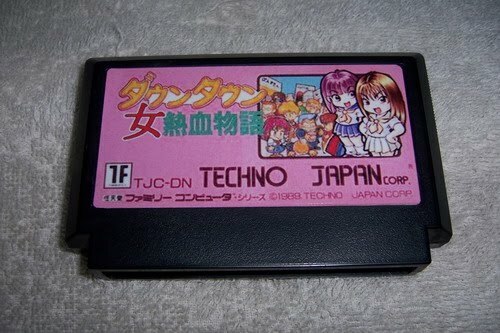 Instead, someone hacked Downtown Nekketsu Monogatari (aka River City Ransom) and replaced all of the game's male sprites with female ones. He/she then went a few steps further and made an actual cartridge and box for the title--and put the whole shebang up for sale on Yahoo! Auctions. The winning bidder handed over a whopping ¥25,510 (about $276) for it. As cool as the game looks (a few screenshots can be seen at the bottom of its Yahoo! Auctions page), I think I'll stick with the original--which I bought ages ago for $5 via the Wii Virtual Console. Would you recommend River City Ransom? I never really played it. I'd definitely say it's worth $5, esp. if you like games like brawlers like Final Fight, etc. It's really not as amazing as many make it out to be, but it is a fun -- and funny -- diversion. Sweet. Well, Kirby Super Star and Bit.trip Runner just came out yesterday...so maybe after I get paid and get those, I'll consider it! Ah, yes, Bit.Trip Runner! I have to get that myself. Let me know what you think of that game, will ya? Professor Layton and the Unwound Future, eh?